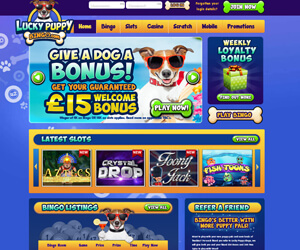 Lucky Puppy Bingo Review | Claim your £15 No Deposit bonus treat! 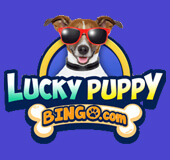 Lucky Puppy Bingo is the ‘funnest' and luckiest new bingo site to launch for 2016! Lucky Puppy Bingo has become the latest super cool addition to the Cozy Games label. The site operates on the Live Bingo Network, and is oozing with fun-packed entertainment and pure gaming cool. You'll be welcomed to the reels by the lucky pup patroller. He comes complete with a range of hot accessories like red shades, a bow tie and an office suit and tie. The lucky pup will serve you with a super cool welcome bonus and range of sizzling promotions. You can then expect non-stop entertainment, thrill-filled bingo, slots and casino games and irresistible chances to win! When you sign up to the Lucky Puppy Bingo adventure, the puppy patroller will throw you a £15 No Deposit bonus treat. You can then pick up a 350% first Deposit welcome bonus on a silver platter. The perks won't stop there! You can also enjoy Weekly Cashback, Daily Jackpot Specials and chances to multiply your winnings with the £5,000 Money Multiplier. When you head to the games lounge you can enjoy special Session Bingo, Free Bingo Tournaments and even £10,000 Mega Slots Tournament. While you play, you can also pick up extra prizes with Chat Games, Break time quizzes and more! You'll be in for a lucky treat when you enter the games lounge. First you can cruise into the bingo suite to hit all the hottest rooms. There's more than enough chances to get lucky with 90 Ball, 75 Ball and Progressive Jackpot rooms. You can also hop on a tour through London to explore themed rooms like Big Ben, London Hall to Buckingham Palace. Then you can have a ball in the slots suite with thrilling games like like Aztecs, Crystal Drop, Royal Treasures and New Honey Bees. Next, get your casino rush with awesome releases like Aces and Faces, Classic Blackjack, Deuces Wild and Roulette. If you're still thirsty for more, test your skills with Scratchcards like Asteroids or Happy Hour. Experience the fun and try your luck on the go with Lucky Puppy Mobile. The site is accessible on all devices, including desktop, mobile, IOS, android and tablets.